New Look can help you to refurbish an existing office space that you are currently in or can help you design and build out a new space that you are planning on leasing or moving into. We can retrofit any office space and build out the space to your specific needs. We will take an office space filled with separate offices and give you an open floor plan to accommodate more cubicles or desks to give you more operating spaces, or vice versa, we can take an open floor plan and build you individual offices for more privacy. Build a conference room, kitchen, restrooms, server and storage space all contained within your leased space. We will do everything from providing you with a new electrical service to new plumbing to framing in the new offices to carpeting and painting. If you are remodeling your current office space, our Team can work second or third shift and on weekends to not disturb you during your regular operating hours so there will be no down time to affect your business and lost productivity. Are you looking to update the look of your dated looking building? Or possibly you just need some renovations to exterior features? We can help you with all facets of the exterior construction of your building. Our Team can undertake a new Stucco façade to repointing an entire building for you. We also can install a new flat roof (EPDM rubber, Asphalt, Modified, Membrane, Etc.) system for you to encompass an entire new exterior project to fit your needs and budget. Looking to update the look of a dated entranceway and hallways in your building? New Look has the capabilities of helping you complete all aspects of a new remodel and look in the entrance of your building. We can help you pick out and install a new glass façade, new floor tile or carpeting, updated LED lighting, painting etc., to wow your customers and Tenants that visit your building. We can also extend our services to the hallways throughout your building and remove the old tired carpeting and wallpaper and install new flooring, lighting, stone, tile and painting. The options and possibilities are endless and we are here to help you bring your building into the 21st Century! We can offer you a wide array of restoration services for your commercial building. New Look works very closely with Mitigation Companies to bring your building back to new if you had a fire, flood or roof leak. We will work hand in hand with the Insurance and Mitigation companies to seamlessly ensure that the job is completed from inception to completion and within the budget of the claim to get you back into your home or building as quickly as possible. 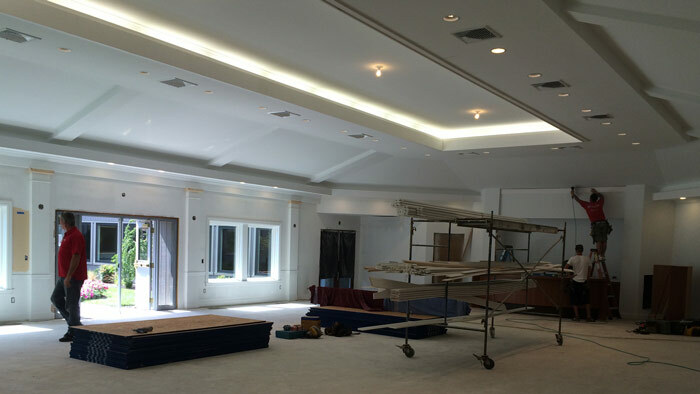 Our Restoration Crews are equipped to take care of all facets of each project from pulling the permit to start the work to finishing the project to your specifications while offering you our design services along the way to provide you with the look and feel to make your space great again. We can help you take an old, tired warehouse space or industrial building and clean it up to give you a vanilla box to show for leasing purposes or once leased, provide you and your Tenant with the fit out to meet their needs. Due to the operations in lots of industrial spaces, interiors of buildings get dirty and dingy very quickly and most of the time need a total revamp to accommodate a new Tenant, or to re-freshen your space for the next 10 year lease that you have just signed. New Look can help you to accomplish all of your needs. We can strip down your existing floor and install a new epoxy and polyurethane floor system in your warehouse or manufacturing area to give you a long term flooring solution in lieu of just painting a floor over again. We can re-carpet your office space, paint your walls, install new ceiling tiles, or provide you with a brand new layout if your operations have changed and now you need more of less office space. We can help you with any and all of the work that you will need to either provide you with a showpiece manufacturing facility to wow your clients or just to meet the shear need of a functional workspace. Opening a new in an old restaurant location? Opening a restaurant in a building that needs to total retrofit from an office space? Or just looking to revamp the look of your restaurant? New Look can help you perform all of this work to meet your new needs! Our services include the installation of new cooking and back of the house equipment such as stoves, refrigeration equipment, ducting, fire suppression equipment, etc. to a new remodel that will wow your customers and keep them coming back time and time again. Our services can extend from reframing the restaurant to give you an open floor plan, or possibly separating the bar/lounge area from the restaurant seating area. We can also build you a brand new custom bar to meet your restaurants new needs. 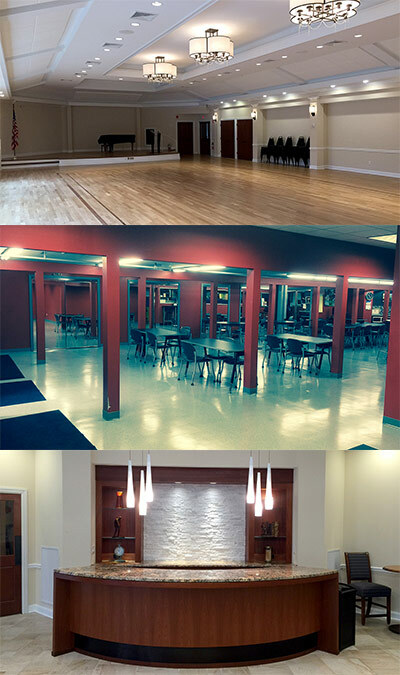 New Look Painting & Construction have worked with some of the most notable Churches and Synagogues throughout Connecticut to refreshen the interiors and exteriors of your houses of worship. We have the capabilities to paint the interiors of your buildings and get you ready for your daily or weekly services as we can get in immediately after a service and be cleaned up by the end of the day so you can hold a mass or service again the next morning to accommodate your regular schedule. We also have the capabilities of painting the exterior of your building whether it be a repointing of your brick building, or painting a 40 or 50 foot steeple with lifts to reach the top. New Look has worked with many Owners and Managers that have worked within the confines of meeting an Historical Commissions strict guidelines to keep the look of a building as originally intended. We can work within the National Register of Historic Places guidelines to the State or Town Historic Preservations office to ensure that your building falls within the guidelines of what can or cannot be done to the building and that we ensure that the materials used fit into their criteria. There are many stipulations on what can and cannot be done to these buildings and New Look can help you navigate this process to ensure that you meet these strict guidelines.